The REI Flash 55 is a highly configurable, ventilated, roll top backpack that weighs 2 lbs 10 oz, but can be stripped down to 2 lbs 3 oz by removing several optional components. If you've never owned a backpack that's this lightweight, the Flash 55 is a good ultralight pack to cut your teeth on. The REI Flash 55 Backpack is an ultralight, roll-top backpack with an optional top lid pocket. Weighing 2 lbs 10 oz, it has a ventilated back to help keep your shirt dry in warm weather and numerous pockets and straps, called “packmods”, that can be removed or reconfigured to lighten it further, up to 7 oz. REI also added two additional side pockets to this year’s model, in addition to two side water bottle sleeves, in order to provide more external storage. Sizing can be a little tricky though, since this new REI Flash 55 is only available in a limited number of fixed length torso sizes, unlike last year’s model, which had an adjustable length frame. Make no mistake, the REI 55 is a true ultralight backpack and represents an exciting leap forward by the Co-op to make lighter weight backpacking more accessible and affordable. Plus, at $199, the price is right. A Women’s REI Flash 55 Backpack is also available. Note: A new REI Flash 45 is also available. While slightly lighter weight (2 lbs 7 oz), it does not have a roll top. Materials: 100-denier ripstop nylon main body; 420-denier nylon bottom; steel frame. The REI Flash 55 is an ultralight-style roll top backpack with an optional top lid. The advantage of using a roll top is that it lets you compress loads from the top in addition to the sides using compression straps. This is useful if your load expands and shrinks during a trip, like when you resupply your food in town on a thru-hike or section hike. The nice thing about having an optional top lid is that you can add it when it’s needed, in cooler weather for example, to carry extra gloves, navigation gear, or smaller items that are handy to have easily accessible on longer hikes. The Flash 55 top lid is also a floating lid, which is important because the pack has a long extension collar that extends above the top of the frame. Having a floating lid lets you raise its height, so it sits properly on top of your load. It also lets you wedge gear between the top of the main compartment and the bottom of the top lid, like a bear canister, tent, sleeping pad, etc, without having to put it into the main compartment. That greatly expands the pack’s utility on more remote or technical trips. The main compartment of the Flash 55 is huge and it will hold a lot of gear and food. It has a hydration pocket inside with a central hang loop, but the rest of the space is unstructured and the only accessible is from the top. REI also, in what may be a first, recommends lining the inside of the Flash 55 with a “trash compactor bag as a waterproof liner for your main compartment.” Needless to say, a rain cover is not included with the pack. The Flash 55 has a mesh front pocket that makes it easy to store damp or frequently accessed items, so you don’t have to stop and open up your pack to access them or put them away. The top of that pocket also hooks onto a plastic dongle for added security. One concern I do have it on the durability of the mesh used on the front pocket and the side water bottle sleeves, discussed below. While the mesh holes are small to prevent snagging, I question its durability for long-term use and off-trail. Solid fabric pockets or pockets made with stiffer, heavier duty mesh are much more durable. The Flash 55 has two mesh water bottle sleeves (located directly behind the hip belt pockets but attached to the pack sides) to make it easy to reach the bottles while you’re wearing the pack. These were a feature on last year’s model and proved popular with users. The bottles sleeves are sized for tall skinny soda or bottled-water bottles and its easy to pull them out or replace them while wearing the pack. While you can also fit a 1 liter Nalgene in the mesh sleeve and pull it out, getting it back in is difficult because the bottle diameter is wider. Both bottles sizes also have a tendency to pop out of the sleeves when you put the pack down or its falls over. The sleeves have snap closures in front to hold the bottles in place, but they’re not totally effective, and they’re difficult to re-snap closed when wearing the pack. REI has also added to solid paneled side pockets behind the water bottle sleeves for holding gear and longer objects, like tent poles, chair kits, fishing poles, etc and lashing them to the side of the pack with a compression strap. It’s an important enhancement, especially on a pack that will be used for longer distance trips. These pockets are not reachable when wearing the pack. There are four additional pockets on the Flash 55, all of which are optional and can be removed. The floating top lid has an external top “Rainshield” pocket. That pocket is made with two layers of fabric and seam-taped, making it highly water-resistant. I hesitate to call it waterproof, because internal condensation is bound to make anything inside damp in prolonged rain. The top lid is attached by buckles and can be easily removed, as well as the straps holding it to the pack. The hip belt pockets are sized to hold a SmartPhone. The hip belt pockets are also easily removable. One is mesh-faced and other has a solid fabric front. They’re large enough to hold an iPhone 6, a small point and shoot camera, or snack bars, but aren’t what I’d call big. They’re held on with a clever webbing strap/toggle system which holds them in place and prevents them from flopping as you bounce down the trail. The Flash 55 also comes with a Rainshield shoulder strap pocket that’s attached to the shoulder pads using the same webbing/toggle system used by the pockets. It’s sized narrow for a Smartphone or a small camera. It snaps shut with a magnet, which always makes me leery on a backpack because it can interfere with a magnetic compass…but it’d be easy enough to cut out and replace with a velcro patch. 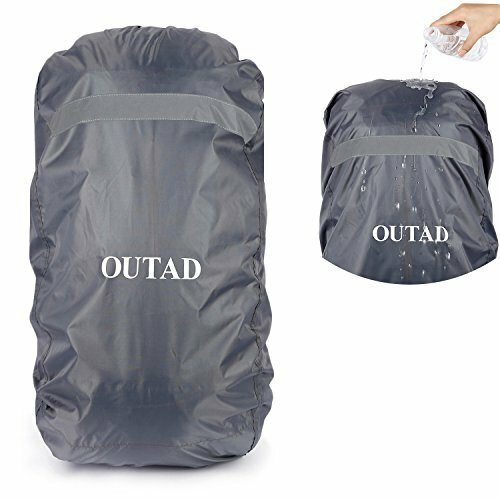 It’s constructed like the top lid, with two layers of fabric and seam-taped, making it highly water-resistant. This pocket is a real value-add and saves you the expense of buying a similar accessory pocket. The Flash 55 includes a shoulder pocket sized for a SmartPhone or small camera. The stock REI Flash 55 comes with an elaborate but easy to use compression and external attachment system. You can use it out the box, as-is, remove the numerous straps (without having to cut them off), or move them around any way you need. All the packs straps are attached to the cord daisy chains so they can be moved or remove. The four vertical corners of the pack have daisy chains loops running down them, implemented using cord, instead of traditional webbing. This is an increasingly common feature found on trail running backpacks, but it hasn’t really caught on yet with mainstream backpacks. All of the straps and attachment points on the pack are girth hitched to the daisy chain instead of being sewn into the pack seams. This lets you detach them, move them to a different location, or change their angles, as needed. REI even includes a mesh sack with the Flash 55 so you can store the straps you’ve removed between uses, and not lose them. Directions for attaching the straps are printed on the outside. Thoughtful. All of the removable straps and pockets weigh 7 oz total. If you’re trying to reduce your pack weight, the biggest bang for the buck comes in removing the pockets (listed below), not the straps. The problem with removing the side compression straps is that you often can’t anticipate when you’ll need them to lash gear to the side of the pack. If you remove the top lid, you can get rid of up to four straps, though I’d still recommend keeping two of them to hold down the sides of the roll top. There are a lot of variations possible, though. The Flash 55 roll top can be buckled closed at the top or along the sides. Doing it along the sides prevents vegetation from getting caught in the pack, especially off-trail. The REI Flash 55 is a ventilated backpack with a suspended mesh panel to help keep you cooler and your shirt drier in warm weather. The mesh is stretched across soft dorsal and lumbar padding and integrated with the pre-curved wings of the hip belt. This provides a comfortable back-hugging fit, but won’t pull you backwards and off-balance, because the ventilation cavity is not as deep as that found on comparable packs, like the Osprey Exos. The Flash 55 has a ventilated back to help keep your shirt drier. The Flash 55’s frame is a lightweight, 360 degree steel perimeter wire (not removable). It provides great torsional flex, so it moves with you, as well as the horizontal rigidity that is important for proper load lifter function and hip belt load transfer. The hip belt is sewn directly to the pack, so that the load is carried very close to your core muscles and hip girdle for maximum efficiency, while the soft lumbar pad and pre-curved hip belt wings grip the iliac crest. I’m really quite impressed with the hip carry on the Flash 55, which is comfortable and does not slip down. The hip belt closes with pull forward straps for mechanical advantage, with a single central buckle. The hip belt pockets are positioned a little farther back on the hip belt than I’d like, so I can’t see the zippers when I look down my sides, but whether they are for you will depend on your physical dimensions. I think the hip belt sizing for both the men’s medium and large sizes is optimistic in the upper half of the sizing range, but your mileage will vary. However, if the front of the hip belt doesn’t cover your hip bones, the pack isn’t going to fit you (See How Should a Backpack Hip Belt Fit?). If you remove the top lid, consider keeping two of the top lid straps to anchor the sides of the roll top. The shoulder straps have a unisex S-shape, with a rail-based sternum strap. They’re thickly padded and covered with a breathable mesh to wick away sweat. Both shoulder straps have elastic hose keepers as well as well a pair of short horizontal webbing straps to attach the Rainshield shoulder accessory pocket, which can be easily moved to the other shoulder strap. . The sizing ranges for the men’s Flash 55 pack are quite narrow in terms of torso lengths and hip belt sizes (see specs above), so I’d encourage you to try on a few different sizes to zero in on a comfortable fit. Based on the numbers, I should be able to use a Flash 55 in a medium, but the large size fits better, both in the torso and the hips. If you’re between sizes, I’d definitely recommend sizing up. The REI Flash 55 is a highly configurable, ventilated, roll top backpack that weighs 2 lbs 10 oz, but can be stripped down to 2 lbs 3 oz by removing several optional components. If you’ve never owned a backpack that’s this lightweight, the Flash 55 is a good ultralight pack to cut your teeth on. Fully configured and out-of-the-box, with its top lid and full compression system, you can use it like your existing backpack as long as you don’t exceed its maximum recommended load of 30 lbs or gear, water, and food weight. If you want to experiment with removing the lid and just using the roll top, or in removing components, you can do that when you’re ready. Regardless, I think you’ll still be impressed at how well the Flash 55 carries compared to a heavier weight backpack with a more substantial frame. If you’re a more experienced lightweight backpacker, switching to the Flash 55 can provide you with a lower cost way to reduce your pack weight than other comparable packs, with more features, and more flexibility. It’s also a far better backpack in my opinion than an Osprey Exos 58 (see our review) and better than the Gregory Optic 58 (see our review) if you prefer a roll top. That’s saying something, because these two packs are the industry leaders for sub 3 pound, ventilated backpacks at the $200 price point. My advice would be to try out the REI Flash 55 and compare them for yourself. This pack is a winner. I’ve hiked 2+ thrus and have used a lot of low weight gear. I’m at the technical definition of UL, but have often needed to carry up to 30 lbs with food and water. Also, I have a somewhat-warranted distaste for REI (another story, I’ll spare you…). And yet, though I have not used this pack, just considering the design, the assessment here seems spot on. Bring your gear to REI, put it in there, and try it on. If it fits you and your gear, go for it. It’s esp nice that it will let you continue to drop weight/features you don’t need, as you become more experienced. One note of caution… ventilation tends to be overrated as a spec. I tend to prefer designs similar to the one here, where it doesn’t make any false promises about keeping your back from sweating. It just helps your shirt dry faster in the evening, when it cools off, IF you are still moving. If you make camp at 4pm, and that’s before your body has stopped sweating, it won’t gain you much. (And the other ventilated designs won’t either.) So, while I offer my meager endorsement to this design, I caution low expectations for reduced back sweat. Ventilation is overhyped. If you carried 30 pounds on your head (perfect ventilation) your back will still sweat. If you want body-hugging, you’ll need to look at internal-frame packs; they are intended to hug your back (sweating is accepted, here) and keep the load close to the center of gravity. If you want to see a good comparison of internal and external, take a hard look at the design elements of the Osprey Exos versus the Osprey Kestrel. You mention you prefer it to the other similar price & weight ventilated, what do you think of it compared to the Crown 2 and Flex Capacitor? I like the Granite Gear Crown 2 because it has an adjustable length hip belt and none of the fixed length hip belt sizing issues of the Flash 55. I also like the pockets / compression system / external attachment options on granite gear packs a whole lot – plus it has much bigger hip belt pockets. The crown 2 38 has actually turned into one of my favorite packs. The Flex capacitor is a good pack, but not a roll top. I’ll really like roll tops. Still its a far more durable pack than the Flash 55. Its a good pack if you beat your packs to death. Different people have different needs and preferences for different trips and regions. Half the battle is figuring out what you need a pack to do. Picking one is pretty easy after that. I really liked the Granite Gear packs I’ve owned (original Vapor Trail, a Nimbus, a couple of Vargas, and a crown VC.) They were great: the lightest, most comfortable pack I ever carried and very well built. They are internal frame, and very well-balanced. The only reason I no longer use them is a Goldilocks story: the small ones are too small, and the large ones are too large. The largest load I carry now just fills a 45-50 liter pack nicely; the small GG packs are in the 35-40 liter range, and the larger packs are in the 55-60+ liter range. If they come out with a 45-50 liter range, I’ll definitely be giving them s good, hard look. “Half the battle is figuring out what you need a pack to do. Picking one is pretty easy after that.” Could almost frame that. Unfortunately I have a 19 inch torso and a 30 inch waist. Probably would not work for me. I’m headed to a REI in a couple of weeks to try these on. It’s possible that I might be able to use the small. These REI UL backpacks are well made and a good deal for the money. I’ve owned the 1st two models with the Cruise UL 60 being the last. That was when I first got into UL backpacking. They served me well. But when I tried an Osprey EXOS 58 I immediately sold my well-used Cruise UL 60 and got the EXOS. More comfortable overall, especially the cooler mesh trampoline back support. Are those additional side pockets large enough to fit a thermorest z lite foam pad? Hi Philip, this pack has a lot of foam (back panel, etc.). Does the foam used absorb water? The foam itself doesn’t but some will “stick” in the holes that pass through it by surface tension. All packs absorb some water, even DCF ones, in the shoulder straps and hip belts which are covered by fabric. If it rains, ah-hem, you’re going to get wet from internal condensation even if you’re wearing rain gear. I wouldn’t worry about it too much. I’ve read a ton of reviews on different packs lately, and this is the best review I’ve ever read, by a country mile. Backpack reviews are a house specialty. Glad I could help. I stopped at the REI in Ann arbor Michigan. They had a good supply of women’s and men’s. Despite my 30 inch waist the size small and medium both seem to fit well. I loaded both the flash and the osprey Exos with 23 lb. For me the flash was much more comfortable. I noticed on the Exos that the shoulder straps we’re very narrow really cut in and almost wanted to twist. The frame on the flash is more flexible than the exos but still rather stiff. the one thing I noticed with the flash is that when I walked around it seemed to shift a little more side to side but not a lot. Hey, Nate, I’m the same dimensions as you. I tried this pack on at REI today and liked it. Please update if you bought the Flash, which size you went with, and how it performed for you (with how much weight) in the field. Thanks. Probably won’t be getting until June. Will update for sure. I’m torn between the REI Flash 55 and Osprey Levity 60 – any thoughts? Get the flash. The side pockets on the Levity are unusable. The flash is a much better pack. Carries more, better, etc. I’m planning a 6 day trip through europe over the summer and am looking for something versatile and light. The only comments I’ve heard against it are that it doesn’t have as many compartments as the osprey so access to specific material is slightly more challenging. But this, I think is something that can be circumvented with a little bit of strategy. I also don’t like the idea of the osprey weighing me down with pockets I will hardly use. Do you feel comfortable strapping gear to the outside of the pack? Such as sleeping bag, etc. Most definitely. It’s easy to strap gear to the outside of the pack using their straps or elastic cord/cordlocks of your own design. I went into REI today armed with my 20% coupon expecting to leave with the Flash 55. Unfortunately, neither the medium or large would fit me properly. I bought a Flash 45 in 2017 and I love it. The best pack I have ever owned. But, I would like something a bit larger for some extended trips I have planned. My 2017 version of the Flash 45 was completely adjustable, but, as Philip noted, the new version of the Flash 55 is not adjustable. I’m bummed out. That’s progress I guess. The 2017 version of the Flash 45 has a floating lid so I am hoping I am going to be able to jam everything I need in there. 6 long strips of velcro, attached back to back, so you get one side fuzzy, and one side prickly. Un-stick the back panel that attached the straps to the pack, and “extend” the velcro attachment panel with the strips, so that the pack sits lower. Made a world of difference for me.